You can add recare types, which you can attach to patients' records to help you track recare appointments for those patients. Dentrix Ascend comes with the most common types already setup, but you can create your own recare type or customize an existing type to suit your preferences. You can use the recare types that you set up to attach recare to patients, using a default interval; however, you can change the interval on a patient-by-patient basis. Note: Recare types are global (available to all locations across your organization). On the Recare Setup page, click (or tap) Create New. The options for adding a recare type become available. Type a name for the recare type, and set up the other options, such as the interval and associated procedures, as needed. Type - Type a name for the recare type. 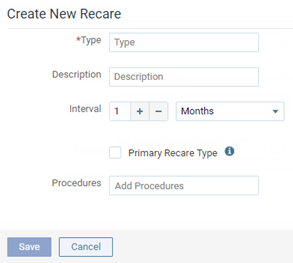 Each time you complete a recare appointment, the due date for the corresponding patient's next recare appointment (of the same recare type) advances by the specified interval. Procedures - Add the procedures that you want to associate with this recare type. Begin typing a procedure code or description, continue typing as needed to narrow the results, and then select the desired procedure from the list. Repeat this for as many procedures as you want to associate with this recare type.